Traub Design Associates - "Pottawatomie Creek Massacre"
The Kansas-Nebraska Act of 1854 triggered events and violence that would come to be known as Bleeding Kansas and lead to the American Civil war seven years later. The question of slavery was at the root of the conflict in Kansas and the entry into the Union as a Slave State or Free. John Brown, a notorious symbol of the anti-slavery movement, was so convinced of its evil, that he believed the question of slavery would only be settled by the shedding of human blood. 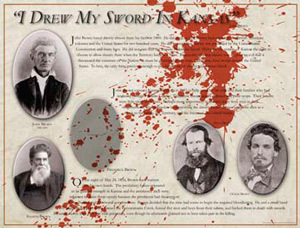 On the night of May 24, 1856, Brown and his sons raided cabins in Franklin County, Kansas, forced five pro-slavery men and two of their sons into the woods and hacked them to death with swords. Five years later the Civil War erupted claiming over 600,000 lives and hundreds of thousands more wounded. It all started in Kansas. The Franklin County Historical Society wanted to tell the story of the Pottawatomie Creek Massacre and called upon Traub Design Associates to tell the stories of that historic event. TDA suggested an immersive environment to recreate the tragedy. Depositions of the widows/mothers of the victims had been taken the day after the incident and those texts were dramatically read by historical actors and recorded for the audio component. Traub Design Associates created a night experience using large nighttime photographic murals of trees to simulate the tree-covered stream where the massacre occurred. Upon entering the space, and eyes adjust, testimonials describe firsthand the events of that night. The visitor is immersed in simulated moonlight and experiences the event through the voices of the victims’ family members. This is a different experience for most museum visitors, who say it is very effective and an emotionally riveting experience. The exhibit was funded with a grant from the Kansas Humanities Council. Exhibition Size: 700 sq .ft. Installation of artifacts, graphics, audio, and lighting.